The Italian prose tale had begun to exercise that influence as early as Chaucer’s time: but circumstances and atmosphere were as yet unfavourable for its growth. George Edward Bateman Saintsbury was born in Southampton, England. He was an English writer, literary historian, and critic. He earned a first class B.A. degree in Classical Mods in 1865 and an M.A. degree in 1868 from Merton College, Oxford University. 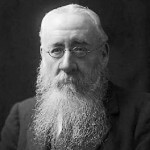 He served as a professor of rhetoric and English literature at the University of Edinburgh from 1895-1915. He wrote several books include: Primer of French Literature, A short history of French literature, A History of Elizabethan Literature, Sir Walter Scott, The earlier Renaissance, Loci Critici, Historical Manual of English Prosody, A Short History of English Literature, A History of English Criticism, and A History of English Prose Rhythm.